Found in Mu Lung while doing Chapter 2 of the Grand Athenaeum, Empress In Training. The same as a real Cute Reindeer. A cute cuddly teddy bear that has come to life. Found in Ludibrium's Cloud and Sky Terrace area. Can move and jump on platforms. A pink version of Brown Teddy. Found in Ludibrium's Cloud and Sky Terrace area. Can move and jump up on platforms. An upgraded Teddy that also appears within Ludibrium's Cloud and Sky Terrace area. Can move and jump on platforms. A Wraith found in the Phantom Forest. Much stronger than the one in Kerning City's subways. A living, moving tree that grows amongst the other stationary trees in the Phantom Forest. You can't tell it apart from the background trees until it launches an attack by growing branches out of the ground. When approached, it makes a sound before using its attack which causes a black root to grow out of the ground and attack the player. Found in Mu Lung while doing Chapter 2 of the Grand Athenaeum, Empress In Training. The same as a real Bellflower Root. A mother duck on wheels with 3 ducklings on wheels following it. Fast, but it cannot jump. Resides with members of the teddy family, in Ludibrium's Cloud and Sky Terrace area. A toy knight on a wooden horse. Fast and incredibly durable, with the ability to increase their physical attack and defense. Found in Ludibrium's Cloud and Sky Terrace area. A blue robot that patrols the Toy Factory of Ludibrium. It resists both ice and fire, and is very slow. A very large amount of them can be found in the Apparatus Room. Found in Mu Lung while doing Chapter 2 of the Grand Athenaeum, Empress In Training. The same as a real Peach Monkey. The boss of the Harps, located in a Mystic Gate at Sky Nest II. 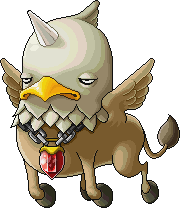 It can use its voice to attack you, as well as cause feathers to rain from the sky hitting you 3 times. A red version of a Robo. 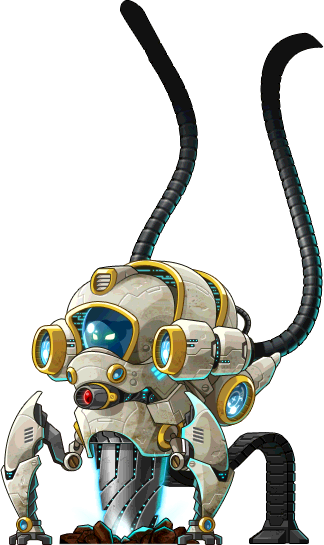 It is faster than ordinary Robos and deals more damage, but is otherwise still an easy monster to overcome. Spawns in the Toy Factory. A small clock monster that neither moves very fast nor jumps, making it an easy target. Found in Ludibrium's Clock Tower area. A larger version of the Tick. This monster is much better suited to combat than its smaller lookalike. Strangely enough its size is programmed to be the same as a Tick, so it is easy to snipe. Found in Ludibrium's Clock Tower area. The Elderwraiths are spirits of Crimsonwood Keep heroes who fell in battle but were never buried. According to legend, a hermit who threw Ilbi at an Elderwraith found them transformed into Crystal Ilbi upon retrieving them. This does not occur for players in game, however. The boss of the Alien Base. 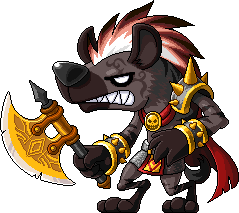 It has the same skills as Pianus, where it can seal, cast Weapon/Magic Cancel, and even summon Bloody Booms. A bipedal crocodile found in Lion King's Castle. Attacks by swinging its sword to create a shockwave. The lowest rank of Chronos. Unlike most other undead monsters, they have no weakness against holy magic. Has no magic attack. Found in Ludibrium's Clock Tower area. The middle rank of Chronos, which gains a magic-based attack that it uses on intruders. Again, weak to healing powers but not to holy magic. Found in Ludibrium's Clock Tower area. The highest rank of Chronos. Like its counterparts, it's vulnerable to heal but not weak against holy magic. They are similar to Platoon Chronos. An easy way to tell them apart from Platoon Chronos is by the color of their hat; Master Chronos have purple hats. Has a magic attack that hits much higher than their counterparts. Found in Ludibrium's Clock Tower area. A yellow jester. Found on the left side path at Ludibrium's Clock Tower Bottom Floor, the Warped Path of Time, with its purple counterpart, in a map which requires 25 Star Force to deal full damage. Doesn't jump or move fast, but has an unavoidable magic attack. A lost soul that has inhabited a discarded teddy bear. The soul can be seen guiding the bear, hovering over its shoulder. Found on the right side path at Ludibrium's Clock Tower Bottom Floor, the Forgotten Path of Time, with its larger counterpart, in a map which requires 25 Star Force to deal full damage. Only the teddy's body, not the soul, can cause contact damage, and take damage. It has a ranged attack that looks a lot like Magic Claw. The strongest specter found in the Tyrant's Castle. It can reduce your speed to 80, and swing its scythe at you. Must be killed for several Heliseum quests. A red Crocky that must be killed to break the first seal in Lion King's Castle. A blue bipedal wolf found at the entrance to Normal Hilla. 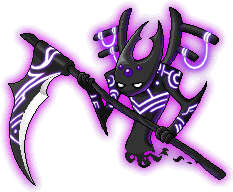 Attacks by swinging at you with its axe, and by charging and releasing a shock of energy which has a long range. A red bipedal wolf found at the entrance to Normal Hilla. Uses the same attacks as its weaker blue counterpart. A monster summoned by Normal Hilla. It does no damage, but it has the ability to pull you toward it, making you unable to move out of its range, until you defeat it. Deadly when Hilla uses her laser blast attack. An clock-like owl creature found in Ludbrium's Clock Tower area with the Master Chronos. Timer's attack can knock you back a fair distance. It also has the ability to cast Weapon and Magic Cancel. 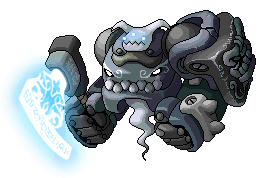 When Timer does casts a skill or an attack, its head spins around, revealing the opposite side, which is gray. One of the bosses in Leafre, found in Manon's Forest in the Kentaurus Areas. Necessary to be defeated to get an item to enter the Cave of Life. It can breathe fire at close range, which reduces your HP and MP to 1. The egg can also attack you, which can stun. 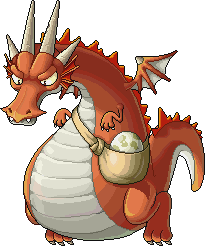 One of the bosses in Leafre, found in Griffey's Forest in the Kentaurus Areas. It can reduce your HP and MP to 1 with one attack. 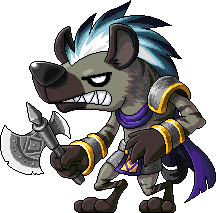 Another attack, where it screeches, can stun you. 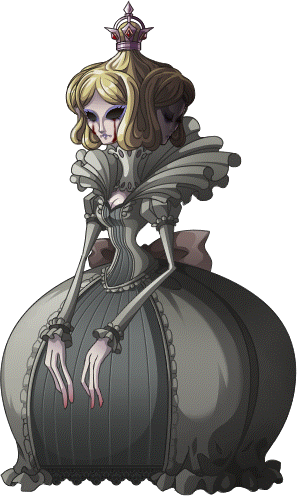 The corrupted version of Manon, which must be killed for the Silent Crusade. It has the same abilities as the real Manon. The corrupted version of Griffey, which must be killed for the Silent Crusade. It has the same abilities as the real Griffey. Eleanor the Black Witch must be defeated at the end of Chapter 3 of the Grand Athenaeum, The Black Witch. She is the one responsible for cursing Ereve and turning everyone except Shinsoo into stone. 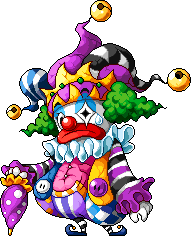 A purple jester. Like its yellow counterpart, it will attack you with unavoidable magic. Found on the left side path at Ludibrium's Clock Tower Bottom Floor, the Warped Path of Time, in a map which requires 25 Star Force to deal full damage. Another teddy bear that has been inhabited by a much larger soul. Appears with regular Soul Teddies. Like Soul Teddies, it cannot jump or fall over. Also, like the regular soul teddies, only the teddy, not the soul part, can cause contact damage. Found on the right side path of Ludibrium's Clock Tower Bottom Floor, the Forgotten Path of Time, in a map which requires 25 Star Force to deal full damage. A fat jester that spawns on the left side path of Ludibrium's Clock Tower Bottom Floor, the Warped Path of Time, in a map which requires 25 Star Force to deal full damage. It can slam its grandfather clock into the ground, hurting you. The corrupted counterpart of the legendary Windreavers, a group of ranged fighters who once served as soldiers at Crimsonwood Keep. Fires am energy orbs using the odd one-handed crossbow it carries, resulting in a charged up throwing star hitting its target. Spawns in the Phantom Forest and Crimsonwood Mountain area of Masteria. The corrupted counterpart of the brave Stormcaster Knights, who once operated out of Crimsonwood Keep. Lukan de Vrisien, a true Stormcaster, has a vendetta against these enemies. Spawns in the Phantom Forest and Crimsonwood Mountain area of Masteria. 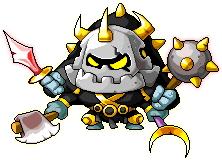 The magic attacks that appear when it swings its spear are pretty dangerous, so definitely don't underestimate them! A fireball that looks a lot like Headless Horseman's head. It breathes fire for its main attack, and flies around freely. Found in the Phantom Forest and Crimsonwood Mountain area of Masteria. A small Yeti found at the beginning of El Nath's Dungeon. Transforms into a Yeti when it dies. The Jr. Yeti's larger form. This version spawns normally. It retains its fire weakness and add an earthquake attack (think King Slime/Mushmom) to its repertoire. This version can also boost its weapon attack/defense. The Jr. Yeti's larger form. This version spawns when the Transforming Jr. Yeti dies. It retains its fire weakness and add an earthquake attack (think King Slime/Mushmom) to its repertoire. A redder and more powerful counterpart of Buffoon, with a more potent attack. Spawns with Buffoons in the same map on the left side path of Ludibrium's Clock Tower Bottom Floor, the Warped Path of Time, in a map which requires 25 Star Force to deal full damage. A darker counterpart of Klock with a more potent magic attack. Spawns with Klocks in the same map on the right side path of Ludibrium's Clock Tower Bottom Floor, the Forgotten Path of Time, in a map which requires 25 Star Force to deal full damage. Must be killed to break the second seal in Lion King's Castle. Also summoned by Prison Guard Ani. Must be killed to break the third seal in Lion King's Castle. Also summoned by Prison Guard Ani. A white reindeer found in Lion King's Castle. Attacks by hitting you with its spear 3 times. A blue pirate ship. Being a ghost, it is surprisingly not affected by heal. Attacks by shooting its cannon, which is unavoidable, but it will only shoot you if you are in an elevated position or at some distance away. Found on the left side path of Ludibrium's Clock Tower Bottom Floor, the Warped Path of Time, in a map which requires 26 Star Force to deal full damage. As you further progress into the Forgotten Path of Time, the souls that have possessed the raggedy teddy bears get fiercer and uglier than the first soul teddy. Shoots a magic projectile that moves very fast. Found on the right side path of Ludibrium's Clock Tower Bottom Floor, the Forgotten Path of Time, in a map which requires 26 Star Force to deal full damage. The corrupted counterpart of the Flamekeepers from Crimsonwood Keep. She might look humanoid, but once defeated, she transforms into a fireball that looks a lot like Headless Horseman's head. Be careful, as she shoots a fire bow which hits you with fire magic. Found in the Phantom Forest and Crimsonwood Mountain area of Masteria. The corrupted counterpart of the Shadowknights, one of the 4 guilds of Ancient Crimsonwood. They use stealth tactics to attack any and all passersby. Attacls by swinging his daggers at a close range. Found in the Phantom Forest and Crimsonwood Mountain area of Masteria. A legendary elemental of air that has yet to hatch. It's aggressive, but it cannot inflict touch damage. Attacks by bursting from the shell and tossing the fragments at you. Once in a while they spawn at Path of Peril alongside fully grown Typhons. Found at the Crimsonwood Mountain of Masteria. A small Dark Yeti found near the beginning of El Nath's Dungeon. Transforms into a Dark Yeti when it dies. The Dark Jr. Yeti's larger form. This version spawns normally. It retains its holy weakness and add an earthquake attack to its repertoire. This version can also boost its weapon attack/defense. Dark Yetis are more powerful than regular Yeti, but are no longer resistant to ice. The Dark Jr. Yeti's larger form. This version spawns when the Transforming Dark Jr. Yeti dies. It retains its holy weakness and add an earthquake attack to its repertoire. The green counterpart of Ghost Pirate. Accessed from a separate map at Warped Path of Time 3 in Ludibrium's Clock Tower Bottom Floor, in a map which requires 26 Star Force to deal full damage. They share the same attack pattern as Ghost Pirates. The yellow counterpart of Death Teddy. Accessed from a separate map at Forgotten Path of Time 3 in Ludibrium's Clock Tower Bottom Floor, in a map which requires 26 Star Force to deal full damage. Attacks with a slower moving orb of light, and is more powerful than Death Teddy. It has holy as its only weakness, and is immune to ice and resistant to lightning and dark. 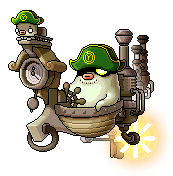 A highly upgraded Ghost Pirate. 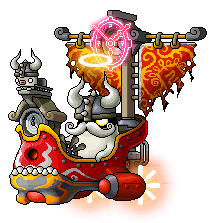 The Spirit Viking is a ghost with viking clothes riding a giant viking boat. It attacks by shooting a cannonball. Found at the end of the Warped Path of Time, in a map which requires 27 Star Force to deal full damage. A ghost chained to a giant clock. It summons an iced projectile at you that moves very fast. Since it is an undead monster, holy powers work against it. Found on the fourth map of the right side path of Ludibrium's Clock Tower Bottom Floor, the Forgotten Path of Time, in a map which requires 27 Star Force to deal full damage. The boss of the Kentauri, located in a Mystic Gate at The Area of Black Kentaurus. It can attack by smashing its hammer into the ground, and stomping the ground (watch out for the area warning). It can also raise its Weapon Attack. A Yeti carrying a Pepe around in a cart. Once their combined HP runs out, they separate and becomes able to be defeated. Their main method of attack is the Yeti's ground pound, and, as usual, jumping evades it. Located at Sharp Cliff 3 in El Nath's Dungeon. Appears once it is separated from the Pepe. Appears once it is separated from the Yeti. A red reindeer found in Lion King's Castle. Attacks by hitting you with its spear 3 times. A golden bee that spawns when a certain number of monsters is killed at the Lion King's Rose Garden. A larger counterpart to the Spirit Viking. Accessed from a separate map at Warped Path of Time 4 in Ludibrium's Clock Tower Bottom Floor, in a map which requires 27 Star Force to deal full damage. With a cannon magic attack and a large touch damage radius, they can be quite dangerous. According to the Papulatus quests, They followed Papulatus from the other "Dimension." An uglier counterpart to the Phantom Watch. Accessed from a separate map at Forgotten Path of Time 4 in Ludibrium's Clock Tower Bottom Floor, in a map which requires 27 Star Force to deal full damage. It is different from the Phantom Watch besides its looks; instead of shooting projectiles at you, it causes icicles to rise out of the floor for high damage. 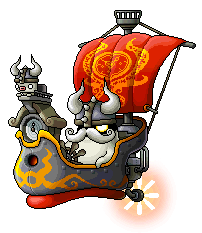 These also followed Papulatus from the other "Dimension" like Gigantic Spirit Viking did. 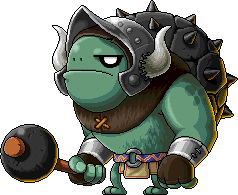 This monster is slow but if you move close to it, it bangs its weapon on the ground and can change between Axes and Swords. Its attacks have a range on the ground, but can be dodged by jumping (similar to the way you can avoid a Yeti's earthquake), provided that you are not underneath its arms when it swings. Freezable, so it is a far easier monster to kill for those with a freezing move. The left side guardian to Papulatus' layer at the base of the Clock Tower, in a map which requires 28 Star Force to deal full damage. The Typhons are associated with wind spirits, and as such serve as elementals of Air. Their magic attack can prove to be annoying to travelers as it can knock you back a good distance, sending the victim into the chasm below. The TCG item "Typhon's Crest" revealed this monster long before it was released. Typhons drop the Typhon's Feather which is one of the ingredients to make Balanced Fury throwing stars. Typhons, which are found at Crimsonwood Mountain, are related to the weaker Gryphons far out at the edges of the Krakian Jungle. A monster found at the North Garden, which is the entrance of the Abyssal Cave, where Vellum is found. One of Hilla's minions. Must be defeated for a quest when you enter the Mystic Crimsonheart Castle and talk to Hilla. Each of the five minions drops a key, which must be used to escape. The same as Black Bird when it comes to attacking. One of Hilla's minions. Must be defeated for a quest when you enter the Mystic Crimsonheart Castle and talk to Hilla. Each of the five minions drops a key, which must be used to escape. The same as Rellik when it comes to skills and attacking. One of Hilla's minions. Must be defeated for a quest when you enter the Mystic Crimsonheart Castle and talk to Hilla. Each of the five minions drops a key, which must be used to escape. The same as Crimson Guardian when it comes to skills and attacking. One of Hilla's minions. Must be defeated for a quest when you enter the Mystic Crimsonheart Castle and talk to Hilla. Each of the five minions drops a key, which must be used to escape. The same as Headless Horseman when it comes to skills and attacking. One of Hilla's minions. Must be defeated for a quest when you enter the Mystic Crimsonheart Castle and talk to Hilla. Each of the five minions drops a key, which must be used to escape. The same as Master Guardian when it comes to skills and attacking. Rarely found in the Shadow Veil Forest's Labyrinth. The same as Master Guardian when it comes to skills and attacking. Appears during the boss battle with normal Mori Ranmaru. It can heal itself and any monster nearby for 5 million health every 6 seconds. Appears during the boss battle with normal Mori Ranmaru. It can stun players for 4 seconds, every 17 seconds. Summoned by easy Von Leon. 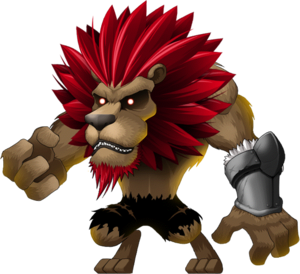 If you don't kill it fast enough, Von Leon will consume these and recover 3 million HP for each one consumed. Summoned by easy Von Leon. Unlike Mini Castle Golems, Von Leon does not consume these. The boss of the theme dungeon part of Lion King's Castle. The corrupted version of Timer, which must be killed for the Silent Crusade. It has the same abilities as the real Timer. Xenon's rival, who is trying to bring him back to Gelimer. At level 120, she challenges you to one last battle at the Silo where they were both turned into Xenoroids. This is the last storyline quest for Xenon. Treglow is a genius scientist who mastered many areas and excelled in chemistry. He also devoted himself to being a Nova guardian, but wanted to create an artifical creature, which was forbidden by Nova scientists. He didn't care, and wanted to push his boundaries. Magnus noticed his passion for research, and decided to use it against him by pretending to be a merchant and sending a spy to support his research, who built a friendly relationship with him. Magnus managed to obtain rare materials from other worlds for Treglow. Treglow was close to creating an artificial creature, but Magnus sabotaged Treglow's experiment, causing a huge explosion in his lab. He was tearing through his ruined lab, stumbling upon creatures that were created, which they were twisted lumps of stone. Having lost all his sanity, he declared them his great success. His creatures (Reagent Rocks) are now minions for Magnus. Rarely found in the Shadow Veil Forest's Labyrinth. It has the same attacks as Hsalf, but doesn't drop anything useful. Rarely found in the Shadow Veil Forest's Labyrinth. You will know if this is in the map if the Labyrinth map you're in is red instead of grey. It has the same attacks as the Headless Horseman, but BE CAREFUL, this version of it can deal 50,000 damage. It's best to take it on from afar. When defeated, drops 5 Tynerum Shards, which are used in the Demon Refuge. The beautiful red-headed boss of Azwan. She used to be a chief shamaness of Azwan until she decided to hand over the city of Azwan to the Black Mage, and received infinite power, youth, and beauty in return. She revived the dead population of Azwan to use as her army. She possesses several skills. She can cast a buff that increases damage you take by 20%. She can also use Damage Reflect, which deals 50,000 damage. She can also slam the ground, knocking any player near her back and shoot fire in front of her to damage the player. She can also heal herself and all enemies around for 315,000 HP, draining your health by 1,500 in the process. She can summon tombstones which deal 50% of your MaxHP and pierces through your iframes so hitting 2 of these can kill you and she can also cast thunder which can stun you. She can also cast a laser blast which will do 50% of your HP if you do not go under the protective shield that appears somewhere in the room. She can also summon Elite Pikeman Skeleknights as backup, and a Deadly Altar, which can pull you toward it until destroyed. Once defeated, she does a quick yell and burns up, and drops Necro Weapons along with other items. The first boss that you will encounter in the Root Abyss. It features various skills, such as being able to make the timer speed up or go in reverse. It can also move back to a spot you were standing at previously. The second boss that you will encounter in the Root Abyss. He mostly whacks you with his umbrella. When fighting it, you will either have a Blue or Red Hat (it changes throughout the battle). When he is purple, you can freely attack him. 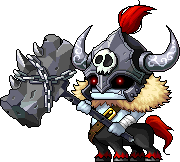 He can change his color to Red or Blue, and you must be wearing the opposite hat in order to damage him. If you wear the same color hat and attack him, you will heal him. The second boss that you will encounter in the Root Abyss. In his red form, he can teleport, and strike with a 1 hit kill attack right afterwards. The second boss that you will encounter in the Root Abyss. In his blue form, he turns into a fiery twister, chasing after a specific person. When touched by his tornado, you will be sealed. He also leaves a trail of fire that does 3000 damage over time. The third boss that you will encounter in the Root Abyss. It has four different faces, each with special abilities. She can change her face any time during the battle, to a random face. All of them possess a claw swipe attack with a different status effect. This one's claw swipe blinds the screen for 5 seconds. She can also take a deep breath and breathe fire in her direction, doing 25,000-50,000 damage to anyone in her path. The third boss that you will encounter in the Root Abyss. It has four different faces, each with special abilities. She can change her face any time during the battle, to a random face. All of them possess a claw swipe attack with a different status effect. This one's claw swipe seals your abilities for 10 seconds. She can summon the Alluring Mirror, which attracts players and then kills them, healing the Queen. She can also summon Heart Bombs, which explode for 30,000 damage. The third boss that you will encounter in the Root Abyss. It has four different faces, each with special abilities. She can change her face any time during the battle, to a random face. All of them possess a claw swipe attack with a different status effect. This one's claw swipe reverses your controls for 5 seconds. She can inhale, sucking the player toward you. 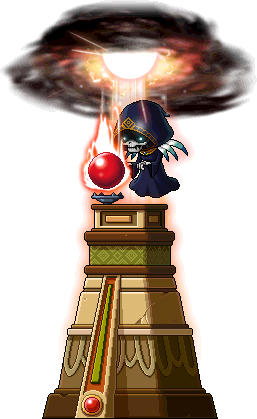 She can also summon a black puddle, which slows your movement and attack speed and deals damage over time. The third boss that you will encounter in the Root Abyss. It has four different faces, each with special abilities. She can change her face any time during the battle, to a random face. All of them possess a claw swipe attack with a different status effect. This one's claw swipe poisons your character for 10 seconds causing 2000 damage a second. She can cast Zombify and Damage Reflect, which is indicated by the Queen being surrounded by a red bubble. Summoned by the Simmering Crimson Queen. It can attract players to it and then kill them, healing the Queen so it recommended to kill this as soon as it is summoned. Ignores Status resist that the character has and can not be dispelled. The final boss of Lion King's Castle, easy mode. Has the same attacks as the normal mode version. Image is reduced, click for full size. Note, Von Leon is even larger than he appears here. This page was last edited on 16 September 2017, at 20:24. This page has been accessed 303,691 times.